Samyang is a Korean lens manufacturer which has taken to producing manual focus lenses in a variety of mounts under both its own name and several others, including Rokinon, Bower and Pro Optic. The 85mm ƒ/1.4 Aspherical was announced in 2009. The Rokinon 85mm ƒ/1.4 Aspherical was designed to fit the full-frame 35mm sensors of Nikon, Canon and Sony cameras, as well as having models available in Pentax, Samsung NX and four-thirds mounts. On a APS-C sized sensor, the lens will produce an effective field of view of approximately 136mm (Canon) or 128mm (Nikon, Sony, Samsung or Pentax); on a four-thirds mount, the lens will produce an effective field of view of approximately 170mm. We've been wanting to test the Samyang lenses for some time and a special thanks goes out to LensRentals.com for sending us a selection to test. The Rokinon 85mm ƒ/1.4 ships with a round lens hood and is available new from between $300-400. Mounted on the sub-frame Canon 7D, the lens provides decently sharp performance when used wide open at ƒ/1.4; stopping down to ƒ/2 improves overall sharpness very slightly. Stopping down to ƒ/2.8 provides excellent results for sharpness, and at ƒ/4 we see tack-sharp results across the frame. This stays true through to ƒ/11, where diffraction limiting begins to set it, but is for all practical purposes still tack-sharp. At ƒ/16 diffraction limiting begins to rob the image of sharpness, and it is fairly apparent at ƒ/22. Mounted on the full-frame Canon 1Ds mkIII, the lens doesn't perform quite as well, as the corners are a bit less forgiving. Results for sharpness when the lens is used wide open at ƒ/1.4 are acceptably sharp, but there is an uneven quality to the image. Stopping down does help to remove this uneven quality and improve overall sharpness: at ƒ/2 there is a slight improvement to central sharpness (at the cost of corner softness, suggesting our sample of this lens was de-centered). At ƒ/2.8, we see the same substantial sharpness improvement we saw with the 7D; the corners still show some light corner softness, but the center of the frame is excellent. At ƒ/4 we can see why the 7D showed tack-sharp results across the frame; it can't see the softer corners. In this respect many portrait lenses would like to have this profile, which emphasizes the center of the frame, and thus the subject, while softening the edges; however, the photographer employing them would probably prefer that this level of sharpness was visible at the ƒ/2 or ƒ/2.8 aperture settings. Stopping down further produces no further improvement in sharpness, and no further reduction in corner softness, and diffraction limiting results are similar to what was noted above with the 7D. The Rokinon 85mm ƒ/1.4 Aspherical provides a very good level of resistance to chromatic aberration, and it's fairly constant across the range of apertures (if you see it, you'll see it in the corners in areas of high contrast). The 85mm ƒ/1.4 suffers, as do most ''fast'' lenses, from problems with longitudinal chromatic aberration, where fringes of red and green are found near the plane of focus when the lens is used at wider apertures. 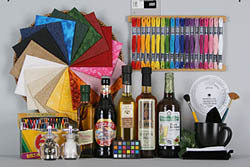 This is easily viewed on the sample images taken with this lens, as magenta fringing when used at the ƒ/1.4 aperture setting. On the full-frame 1Ds mkIII however, it's somewhat more significant: at ƒ/1.4 light falls off to make the extreme corners around 3/4 EV darker than the center; at ƒ/2, this falloff lowers to around 2/3EV. At ƒ/2.8 and smaller apertures, falloff results are a quarter-stop or less, which isn't really significant. The 85mm ƒ/1.4 is very well designed, providing no significant distortion. The Rokinon 85mm ƒ/1.4 is not equipped with autofocus. The lens isn't designed as a macro lens, providing only 0.08x magnification when used at its minimum close-focusing distance of just over three feet. 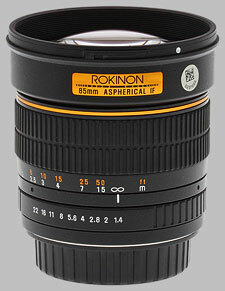 The Rokinon 85mm ƒ/1.4 Aspherical is a small optic, weighing 559 grams (19.7 oz). The lens is black with a slightly stipled finish and has a gold accent ring near the front. The lens mount is metal and the 72mm filter threads are plastic. Generally, the Rokinon 85mm ƒ/1.4, when mounted on the camera body, will provide absolutely no information to the camera, meaning the camera will generally only work in Manual mode. Advanced features like in-body image stabilization may not work. Rokinon does produce a Nikon version of the lens with a CPU chip that allows the lens to communicate with the camera, and use the standard P/A/S/M modes. The lens provides only a very basic feature set. The lens has an aperture ring with half-stop click marks, however there is no locking feature to keep the lens locked at its smallest aperture for modern cameras. Also, there are no half-stops between ƒ/1.4 and ƒ/2, and none between ƒ/16 and ƒ/22. 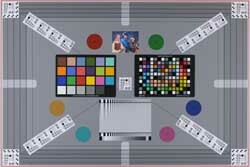 The lens has a distance scale marked in feet and meters, but no depth-of-field scale, or infrared index marker. The inch-wide focus ring is rubber, a series of ribs running parallel to the body of the lens. The focusing ring provides around 140 degrees of turn, and the range ends in hard stops at the infinity and close-focusing ends of the lens. There is no lens extension during focusing, and the front element does not rotate. The lens uses eight diaphragm blades to make up the aperture. The round lens hood is around 1 1/2 inches in depth. The hood is a bayonet-mount that reverses onto the lens for easy storage. The Nikon 85mm ƒ/1.4G provides a sharper image, but similar results for corner shading and distortion. Chromatic aberration is better lateraly (color shifts in the corners) but there is some evidence of longitudinal CA (color shifts at very wide apertures). The Nikon also has autofocus, where the Rokinon does not. Canon doesn't actually make an ƒ/1.4 lens - it makes a really expensive ƒ/1.2 and a more economical ƒ/1.8. The ƒ/1.8 lens we tested (many years ago) didn't provide great results for wide-open sharpness, but stopped down it was a good performer; results for distortion, CA and corner shading are similar or slightly better than the Rokinon. Again, autofocus is built-in to the Canon lens. The Carl Zeiss 85mm provides a similar manual focus experience, though there is definitely a quality difference with regards to the feel of the Carl Zeiss 85mm - it is silky smooth. The Zeiss lens is substantially more expensive, and there is indeed a more even sharpness when mounted on full-frame. The Pentax 55mm provides an equivalent of around 83mm field of view on a Pentax digital body, so it would be the point of comparison for Pentax users. The lens provides very good sharpness at ƒ/1.4 and ƒ/2, and tack-sharp results at ƒ/2.8; Corner shading is minimal, but the lens provides slightly more CA and distortion. The Pentax 55mm also features autofocus. The Sigma 85mm ƒ/1.4 provides a sharper image than the Rokinon, but similar results for corner shading and distortion. Chromatic aberration is better lateraly (color shifts in the corners) but there is some evidence of longitudinal CA (color shifts at very wide apertures). The Sigma also has autofocus, where the Rokinon does not. The Sony 85mm ƒ/1.4 rivals Canon and Nikon glass as some of the sharpest we've tested, and is certainly sharper than the Rokinon 85mm. Similar issues as the others with regard to longitudinal chromatic aberration, but otherwise, distortion and corner shading are well-handled. It's a crowded field in the fast 85mm lens market, and Samyang's approach to make an economical manual focus lens was a wise one: if you don't need autofocus, but want the razor-thin depth-of-field of a fast lens for not a lot of money, the lens was already on your radar. In this case Rokinon provides a good lens, but not a great lens: for most users who buy the lens to use it strictly at ƒ/1.4 they may be disappointed (and frustrated, as achieving focus with such a thin depth of field will be exceptionally difficult without autofocus). Stop down to ƒ/4 and you'll get excellent results with this lens, but you wouldn't buy this lens to use it at ƒ/4. Just replace the lens hood with a metal one . Quite why this site would review the Canon ,not chipped version and then put it on a crop sensor camea does not make any sense to me. Just ignore the distortion and vinyetting issues because there arnt any in real life photography. shoot portraits at f2 or couples at F4 and you will be very pleased. Bought this lens for my Sony A7m2 full frame mirrorless camera to get a bit more range than my 24-70mm zoom. This fits the bill as it is still compact, while giving me the bit more reach I wanted. Not up in quality to the Sony/Zeiss lenses, but for the money it can't be beat. This is actually my favourite lens for portraits, on Canon 5D MarkII. The sharpness is surprisingly good at f/1.4, and razor sharp at f/2.8. Without noticeable chromatic aberrations. I had in the past the Zeiss-Contax 85mm f/1.4, which is better built, but suffers from its too simple optic formula and was too soft at f/1.4. This Samyang is clearly better at wide apertures! Moreover, the bokeh is really fantastic which is a great plus for portraits! The lens is well built, only the lens hood is a bit cheap and no pratical to put, so I've tuned it : a metal lens hood (standard 72mm - not too long) + a lens hat. With that metal hood, it's a very sturdy/well finished pack. If you don't mind using manual focus (live-view manual focus help a lot - or precision glass for viewfinder), this lens is very good option at a bargain price. The only 'bad' thing (subjective) is that its manual only lens. This lens was a gift - and takes great pictures on my Pentax K-30. It can be difficult to focus wide open - especially if the subject is at the far end (7-15'm or greater) as its very little movement with a huge change in range, with little DoF. Image is sharp across with the K-30, as its an APS-C and this lens is FF design. It works well with the Pentax focus indicator as well. Other uses for this lens - video (manual focus recommended). The smooth focus ring is excellent for shooting video. In general - if you're looking for a fast, inexpensive sharp portrait lens with great bokeh... this is a very good deal. sharp, superb optics, lightweight, CHEAP!!! a very recommended portrait lens, especially for the price. This lens simply delivers high quality results when used properly. I have owned the Nikkor AF-D 85/1.4 and the zeiss 85/1.4 and believe it or not, this Rokinon/Samyang can compete with those lenses. The only main difference is on the tone they produce. Sharpness is okay, even wide open. It's tack sharp when you nailed the focus (it's a 85/1.4, it has an ultra-thin DoF). Bokeh is creamy and always fantastic. It easily creates stunning portrait photos right away. This lens has good ergonomics. It has wide & smooth focusing ring. Compared to other modern 85/1.4, this lens is feather-weight. Thanks to the mostly plastic shell. Construction feels good, and it also comes with a plastic hood to protect the front element. Final words, this is the lens for portraits. For the price, it can't go wrong. you'll get 85/1.4 performance for the price of 85/1.8.. sweet!